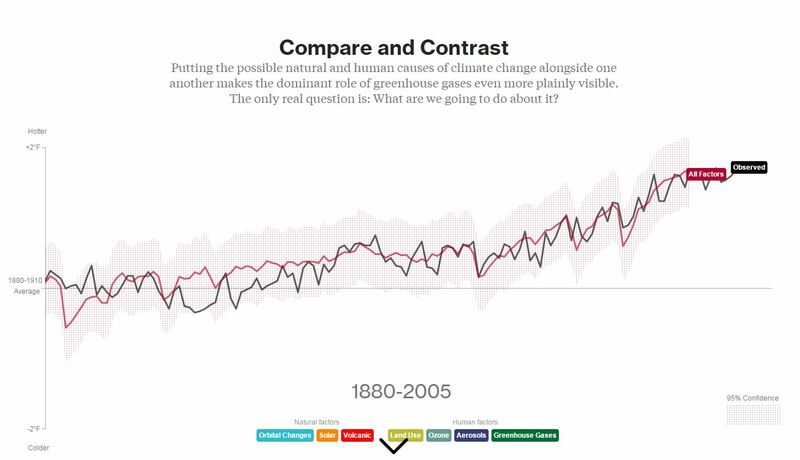 Bloomberg has created a nice interactive to explain the cause(s) of global warming. Hint: it’s not the volcanoes or the Sun or ozone pollution. The cause of global warming is almost surely the greenhouse gas emissions. Researchers who study the Earth’s climate create models to test their assumptions about the causes and trajectory of global warming. Around the world there are 28 or so research groups in more than a dozen countries who have written 61 climate models. Each takes a slightly different approach to the elements of the climate system, such as ice, oceans, or atmospheric chemistry. The computer model that generated the results for this graphic is called “ModelE2,” and was created by NASA’s Goddard Institute for Space Studies (GISS), which has been a leader in climate projections for a generation. ModelE2 contains something on the order of 500,000 lines of code, and is run on a supercomputer at the NASA Center for Climate Simulation in Greenbelt, Maryland. ← A World Without Work?